You probably wouldn’t recognize me if you saw me eating at home. While I desire a bounteous and decadent spread when dining in restaurants, I want nothing more than straightforward and nutritious fare when I’m not. The internet and my bookshelves are crammed with virtuous recipes and health-conscious eating guides, but not just any fibrous or low-fat dish will do. I demand that it be delicious, too! 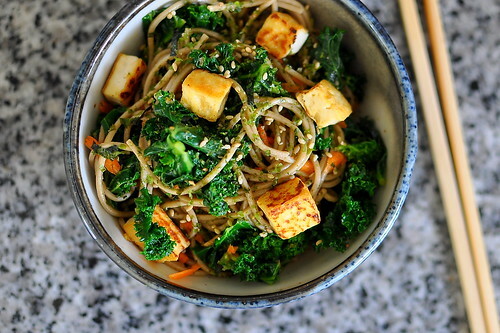 My current favorite good-for-me and good-for-my-taste-buds dish is these Soba Noodles with Kale, Tofu, and Furikake from Diane of Appetite for China. What I really like about this recipe is that even though the ratio of vegetables to noodles is skewed towards the former, it doesn’t taste like bowl of rabbit food. I’ve never been much of a salad-eating gal. The key is the well-balanced dressing made of soy sauce, sesame oil, scallions, rice vinegar, and honey that paints every surface and ties all the elements together. And then there’s the furikake, a delightful Japanese condiment made of seaweed, sesame seeds, salt, and sugar that excites the tongue with a dose of umami. This dish tastes great, is easy to make, and satisfies in every way. I want nothing more when I’m eating at home. 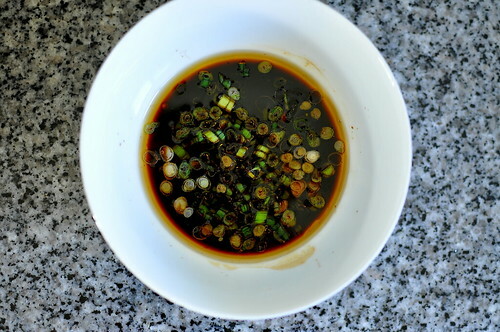 In a small bowl, mix together the soy sauce, 2 tablespoons sesame oil, vinegar, honey, and scallions. Let the sauce marry while you prepare the other ingredients. For the kale, bring a medium pot of water to boil. 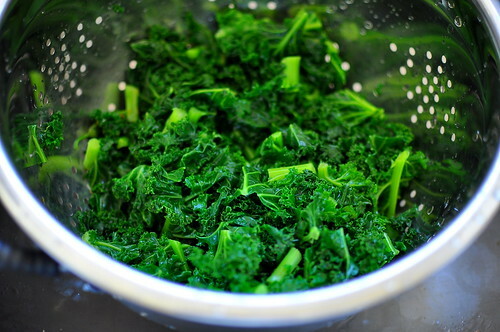 Add the kale leaves and cook for 4 minutes. 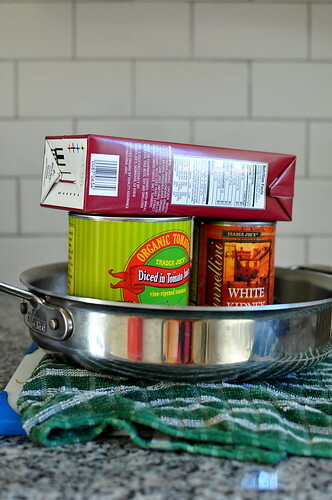 Drain and rinse under cold water, then squeeze out the excess water. Set aside. 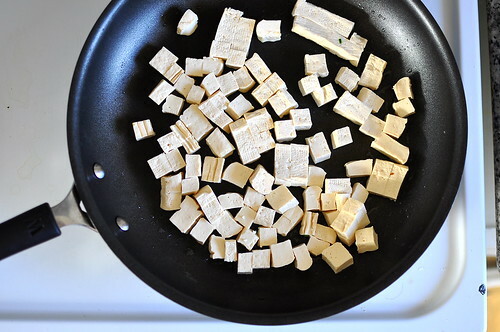 Cut the tofu into 1/2-inch cubes and lay on paper towels to absorb excess moisture. On medium-high heat, saute the tofu in 1 tablespoon of sesame oil for 2-3 minutes on each side to lightly sear the outside and heat the inside. Set aside. 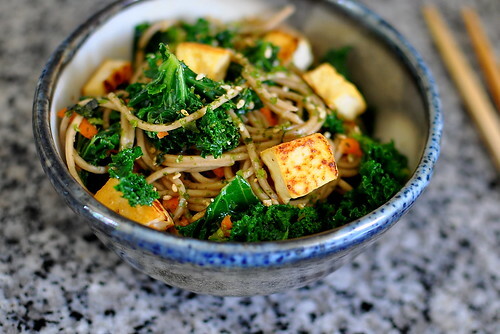 Combine the carrots, kale, seared tofu, and soba in a large bowl and toss with the soy-sesame mixture. To serve, transfer to bowls or plates and sprinkle with furikake. This looks great! Will jot down for future warm-weather dinner. Perfect timing! I was wondering what to make w/my block of firm tofu that wouldn’t be the same old thing. This looks fantastic. Thanks, Cathy & Diane of Appetite for China! Thank you! I just made this tonight after finding your recipe from Tastespotting.com. I substituted chicken for tofu and it was delicious! Can’t wait to eat my leftovers for lunch tomorrow! Oh yum. This looks delicious, and healthy! I could really use some satisfying but good for me meals right about now. On my to-make list! Yum! 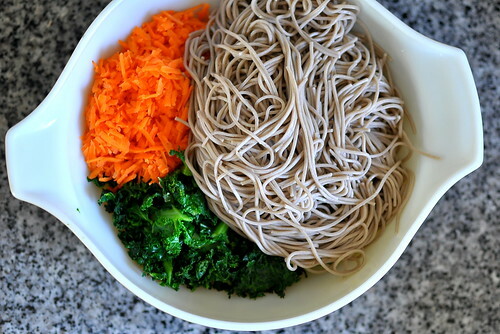 I’m such a big soba fan and I’m always looking for new inspiration, thanks! This looks absolutely delicious! But one word of caution – furikake traditionally contains fish! It is possible to find kinds that do not, but often the labels are in Japanese and it may be difficult to tell, unless you can read Japanese or if the store is nice enough to put a translated label on. I know the furikake I own is salmon-flavored. I saw that it’s tagged as vegetarian, so, just something to watch out for! Thanks, Stephanie! For those unfamiliar with furikake, try this brand that doesn’t contain MSG or fish bits. this makes me want furikake popcorn! This literally looks like the best dinner I’ve ever seen. YUM!!! Awesome pictures. Melinda – All fixed! Thank you! I made this for my family the other night and they all loved it. They have been asking for it again, so I am cooking it again tonight. I will be using our own tofu that we made from scratch this afternoon this time. Thanks so much for the recipe. Pingback: Recipes on the To-Cook List | Death by Pineapple! Furikake is **not** vegetarian. In fact, it’s made of dried fish. There’s also MSG in this Japanese condiment. I like the recipe but I’ll skip the furikake. Wow! I tried this for the first time tonight during our storm watch. Full of flavor and so easy to make! Furikake is my favorite seasoning to use! Thank you for the wonderful idea/recipe!